Toddlers love to play with things that move and go, making toy cars one of the most popular toys for this age group. While it’s simple enough to make these toys safe for small people to play with, they generally have working parts, some even make noise which really engages children. The key factors with toy cars are colors, size, shape, and their abilities. A toy has to be exciting and creative, or realistic enough to engage a young child’s mind and spark their imagination, and when it comes right down to it, not all toy cars are made the same. Some are far better than their competitors. This list offers a look at the models that stand out from the rest, and what it is that makes them some of the best toy cars for toddlers. These cars are ideal for very young children. Built with a large O ball over the top, complete with holes in it, this is easy for small hands to grab and roll. It is soft and flexible making it safe for small children, and a great teething toy. 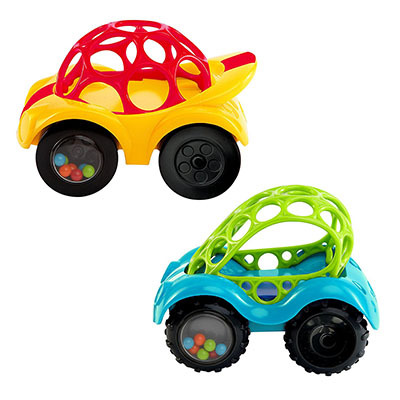 Each wheel on this vehicle has rattle beads inside creating a fun and exciting rattle sound as the car rolls across the floor or is shaken in the air. This toy is safe while being engaging through sight and sound, making it a top pick for best toy cars for toddlers. 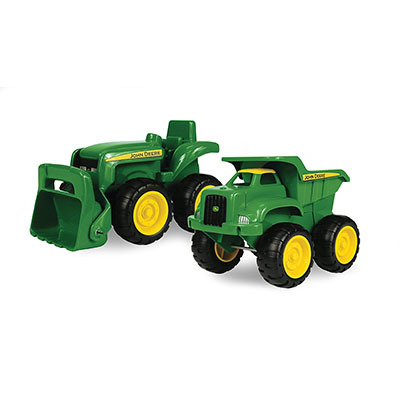 These vehicles are very accurate replicas of the actual truck and tractor, making kids excited to play with such fun pieces of machinery. 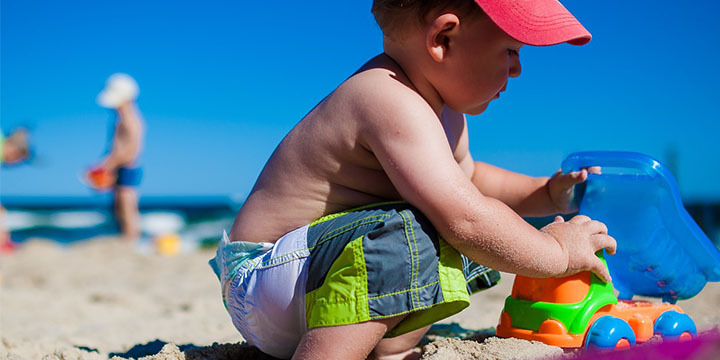 They are created out of a very durable plastic which makes them sturdy enough to handle play indoors or in the sandbox. The free rolling wheels allow the vehicles to roll properly, just as the real thing would do, and they come with fully functioning parts allowing the dump bed to pour out sand and the front loader to push it around. 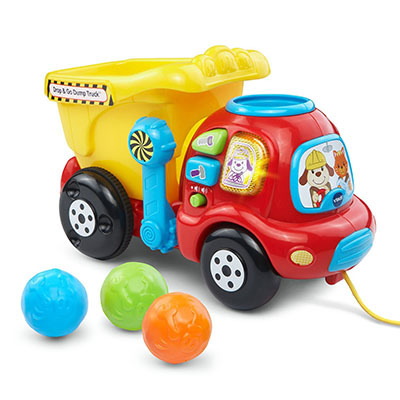 This dump truck comes complete with colorful balls that look like rocks which can be dropped in the top of the truck, from there it will tumble them into the bucket. Once all the rocks are inside the truck, it can be pushed or pulled which will make the rocks tumble and bounce around on the inside, something children will find incredibly entertaining. One of the best features on this truck is that it plays lots of music, which toddlers will love, says many phrases, and as the rocks are being placed in the truck it helps in teaching both counting and colors, a great educational tool that parents will love. This vehicle is a lot of fun and offers a lot of noise and activity which will engage children very well making it a great choice for one of the best toy cars for toddlers. 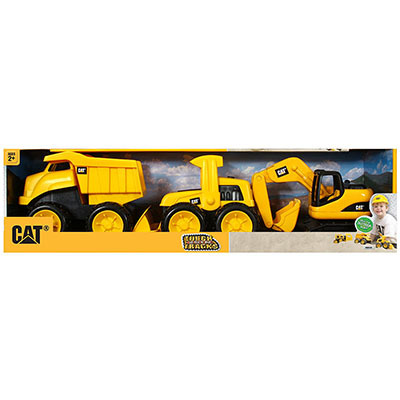 This truck and machinery set is wonderful for creative minds who love big machinery, which is what makes it one of the best toy cars for toddlers. Bring home replica’s of the machinery children love watching at construction sights and allow them to become the foreman, building and maybe even wrecking crew. The machines are officially licensed by CAT, making them more like the real construction equipment. All pieces are made from plastic meaning they can hold up to sand, play and even water quite well. In this set is a bulldozer, dump truck and back-hoe, allowing children to really get creative and play. Best of all, there are no batteries required. This set is a lot of fun for small hands. Each truck comes in a bright color that really engages and excites young children. 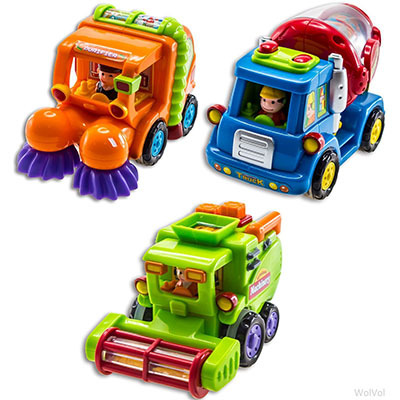 All these vehicles are created to look like common large machinery children see on a regular bases and would enjoy playing with including a street sweeper, a cement mixing truck and a harvester. Each piece has a rotating function, the sweepers on the street sweeper spin, the front wheel on the harvester spins and the cement barrel on the cement truck spins. This creates a more realistic and exciting experience for children. These truck can all be rolled forward or backwards, this creates friction which is similar to winding them up, they will then roll a very far distance. They allow kids to be creative and have fun, while bringing real life machinery to their small hands which is what makes these some of the best toy cars for toddlers. These trucks are small but pack a mighty power. Each truck can be pulled backwards, which is similar to winding it up, and once it is let go it will fly forward across flat surfaces. Each truck s created out of plastic and is quite sturdy, meaning it will hold up well to small hands. 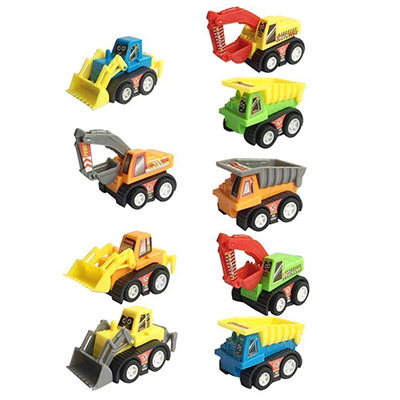 The set includes a total of 9 toys, 3 bulldozers, 3 excavators and 3 dumpers. The trucks are small, meaning it will help develop the motor skills of small children, and help better develop hand and eye coordination. Children love to play, and there are many ways to keep them engaged. Sometimes they need lights and sound for excitement, while other times it is great to have something a bit more simple forcing them to use their imagination and create a game. All children need and love both types of stimulation, which is what makes the list of the best toy cars for toddlers so diverse. Some toys are busy and noisy, while others simply allow the child to take control and create the entire game.